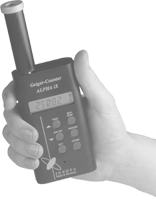 The radiometer ALPHAiX is a mobile device for contamination messurement providing efficiency and accuracy which usually is mastered by statonary equipment. ALPHAiX is applicable in professional and industrial contexts as well as in private environments. 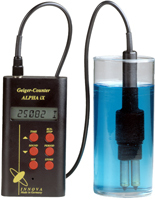 The ray meter is a modern Geiger tube which relies on micro processor electronics for analysis of different contamination variants. The device supports a number of different sensors(counter tubes) for precise measurements. In addition to counter tubes for ALPHA- BETA- and GAMMA radiation we provide special sensors for measuring liquids and bulk material for organic food. 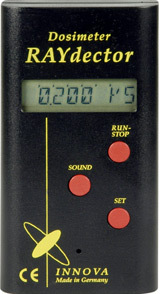 It is well known that contamination meters work more complex and sensitive in comparison to dosemeters. The latter are designed for GAMMA ray measurement only. Special sensors are available on request. The ALPHAiX device is about the size and weight of a modern cellphone. pulses referring to total measurement period. average value of pulses during one minute. µSv/h – measurement of doses (GAMMA radiation) shielding ALPHA and BETA radiation (µSv/h = micro-Sievert per hour). After collecting measurement data you connect ALPHAiX to your computer for data transfer. Just order the software. 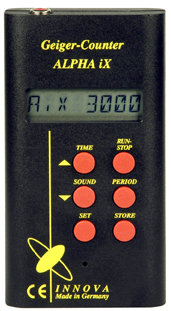 ALPHAiX is an extraordinary mobile ray meter even capable of measuring inside food and liquids. detection limit from 1 Becquerel! We complete our program with the dosemeter RAYdector. 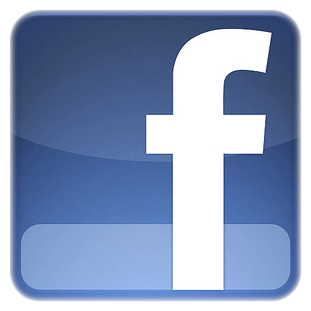 The device is designed specifically to measure high-energy gamma-rays.